This beachside 1 bedroom condominium apartment is located in the Ashford 890 Condominium complex in San Juan's El Condado district. 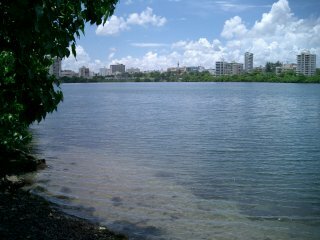 The complex is located directly on Condado Lagoon, and across the street from Condado Beach. The Condado Beach area, it is perhaps the most popular, and well-maintained beach in Puerto Rico. 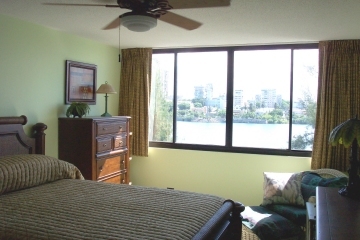 The apartment is tastefully decorated and furnished with all amenities. It includes cable TV with VCR, air conditioning and ceiling fan. The condominium is located within walking distance to all major restaurants in El Condado. It is also with short walking distance to the El Condado Plaza Hotel and the popular Condado Beach. A 1 bedroom apartment with fully equipped kitchen, Air conditioning, Cable TV, a Queen Size Sofabed, Telephone service . All bed and bath linens, off-street parking, ocean side balcony with views of the both Ocean and Condado Lagoon. Located in the popular Condado district of San Juan, Puerto Rico. This caribbean vacation rental apartment is located in the beautiful Condado 890 Condominium located in El Condado. The public beach nearby is a very popular white and golden sandy beach suitable for sun bathing, swimming, wind surfing, and other water activities. It is just a short walking distance away from the Condado Plaza Hotel and Casino Complex. El Condado is one of San Juan's most popular tourist districts offering plenty of restaurants, shopping, proximity to major resort hotels such as The Mariott, Condado Plaza and other popular hotels. Relax in your very own studio apartment after your cruise or extended business conference.